Unlike Southern California, unpredictable weather and a limited number of quality skateparks are persistent challenges in New England. This environment creates a rare breed of determined all-around skateboarders like Nora Vasconcellos. Nora debuted at the X-Games last year with 6th place in vert and an appearance in the girls’ superpark demo, I have no doubt that she could have excelled in the street contest as well. 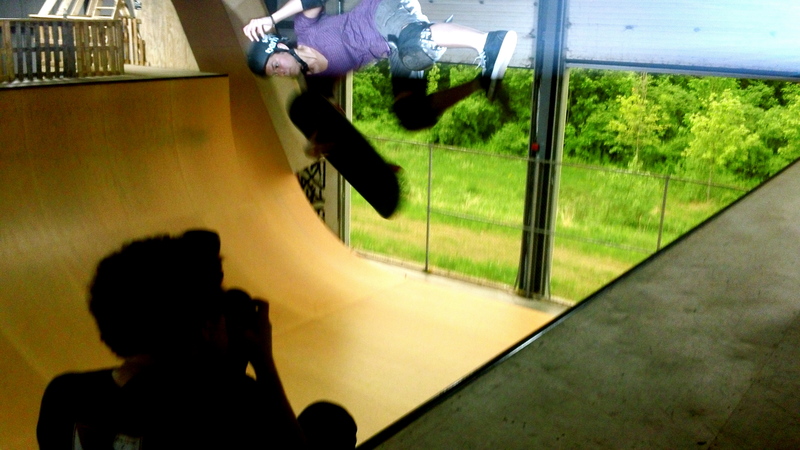 Day one began with a hailstorm so we road-tripped up to Rye Airfield, a 50,000 ft. gem of an indoor skatepark tucked away on the coast of New Hampshire. There, Nora boosted head-high airs and tech lip tricks on their brand new vert ramp as we took photos for the girls’ skate book and video for the documentary. Nora and I began to discuss the logistics of arranging and organizing a women’s vert series that we are shooting to launch with an event at Rye January 2012. The trek back from Rye to Nora’s house consisted of dodging lightening and tornadoes, but by the next morning the weather had cleared up enough to document Nora at her local park in Hingham, Massachusetts where she easily strung lines of tech lip tricks throughout the bowl. Next steps in the documentary process include interviews with ESPN folk, people working in the skate industry, and compiling more footage of skilled skateboarding.